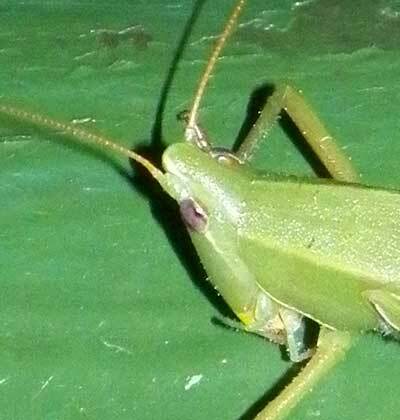 This conehead katydid was drawn to electric lighting at a hotel at Iten, Kenya, January 2012. This male is about 7 cm long. 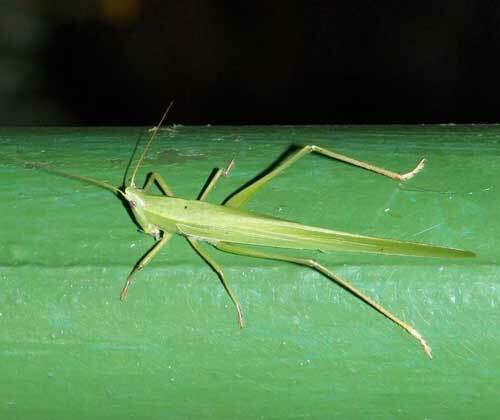 Katydids when upon a shrub or tree are virtually invisible due to their great resemblance to the leaves themselves. Note the very long, flagella-like antennae. This subgroup of katydids are also known as cone-headed grasshoppers due to the elongation of the face-head. Food is mostly leaves and buds but they are fully capable of taking other insects as prey also.